Advertising revenue is extremely important to the Internet sector, though reliance on advertising revenue varies among industry participants. Certain Internet firms such as Amazon, eBay and Priceline operate online marketplaces and derive revenue from premium postings and commissions from sales on their respective platforms, reducing the importance of advertisements. Companies such as Salesforce generate revenue by charging users for services. This model is becoming increasingly popular as software-as-a-service providers proliferate, especially for enterprise solutions. Media companies such as Netflix or the Wall Street Journal can charge users for subscription memberships because they offer unique, high-quality content. E-commerce retailers generate income through retail sales in the same manner as traditional brick and mortar retailers. Advertising generates the vast majority of revenue in the search and social media portions of the Internet industry. Google, Yahoo and Baidu all rely heavily on income from advertising. According to Search Engine Watch, 47% to 64% of total website traffic comes through search engines. This allows search providers to charge vendors for display ad placement or sponsored search results. Popular social networks such as Facebook and Twitter have become common mediums for communication and entertainment, resulting in heavy traffic and access to substantial user data. User volume and targeted advertising are attractive to businesses that are trying attract customers, and social networks have exploited this advantage substantially. To illustrate these points, consider the 2014 annual filings for the largest Internet firms. According to Pricewaterhouse Cooper, the ten largest U.S. companies in terms of digital ad revenues control 71% of the market, and the next 15 companies hold an additional 11% market share. The largest companies provide an excellent gauge of overall industry conditions. For the online marketplace operators Amazon, eBay, Alibaba and Priceline, advertising revenues contributed 7%, 16%, 1.6% and 5% respectively. These advertising contributions also include revenue from marketing solutions and other services, meaning that the actual ad revenues are even lower than the available figures. Salesforce derives substantial income from subscription fees and support services, and advertising income is not even mentioned in its 2014 10-K. Netflix similarly generates substantial revenues from membership fees, and it does not publish figures related to ad sales. Advertising contributed 90% of Google's total revenue, 79% of Yahoo's total revenue and 99% of Baidu's total revenue. Digital advertising accounted for 92% and 90% of Facebook's and Twitter's total revenues, respectively. The importance of advertising revenue will continue to grow as technology advances. According to a 2014 report by Pricewaterhouse Cooper, U.S. online advertising revenues grew 15.1% year over year to $23.1 billion in the first half of 2014. During this same period, mobile ad spending grew 76%. As mobile devices become ubiquitous, local, real-time and precisely targeted advertising will become increasingly valuable for businesses. Revlayer is a new service that enables you to put ads over embedded video clips in order to generate revenue for yourself. @StylistMagazine really interested to understand decision to close digital edition. Surely advertising revenues can fund an app developer? 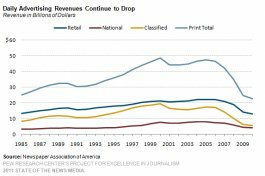 RT @jjkaraganis: Julia Cagé notes that the decline in US newspaper advertising revenues began in 1956. Pretty close to a straight line.